Marc Topkin of the St. Petersburg Times is reporting that Desmond Jennings, Dioner Navarro, Rocco Baldelli and Jose Lobaton are headed to the Rays. Part of that report (Lobaton) really makes no sense at all, but will probably be sorted out eventually. I’m of two minds about how to put this out in the blog, but seems like most of the readers of WDBB understand the uncertainties. And I will make every effort to keep my focus on the Bulls, not the Rays. Rocco Baldelli is not on the 40-man, which means the Rays will have to do some bookkeeping razzle-dazzle (if Topkin is right) before Rocco gets to St. Pete. Since I am temporarily on the disabled list I had to suffer through the game in front of the TV at home, so if I missed any particular nuance, please let me know. You can be reasonably sure that I didn’t get it from the broadcast (more later). 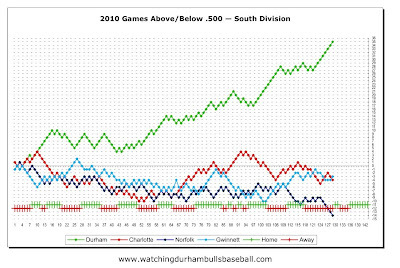 Charlotte essentially gave the Bulls three runs in the 2nd to go with Justin Ruggiano’s home run in the 1st.The Bulls were cruising along very nicely until Charlotte got three of the runs back in the 5th as Ramon Ortiz began to look really shaky giving up a walk, two singles, a double and a sac fly. Ortiz got thrown out of the game! I’ve never seen that before — a pitcher getting tossed, apparently for arguing balls and strikes. Throwing at a batter, sure, but for arguing with the ump? Must’ve said something really ugly. Brian Shouse came in and for a brief moment things looked OK, since Flowers grounded into a double play. But Shouse did not make it through the inning either. Two walks, a single, a double, and three runs later Shouse is out of there and the Bulls are behind 6 to 4. Joe Bateman came in for the last out, but the damage was done. The Bulls could put nothing together after that. In fact, Charlotte got two more runs. So on to my rants for the day. Rant #1: Brian Shouse has made seven appearances (9 innings) in a Bulls uniform. Results? Two blown saves (and losses) and an ERA of 9.00. I know we’re short on pitchers, but surely there’s someone downstream in the Rays system who is worthy of spending some time with the Bulls. Rant #2: Rich Herrera (sp?) on the radio/TV. This comes in the form of advice. I doubt that he will be reading this blog, but maybe. Remind yourself every 30 seconds — It’s radio. They can’t see. It’s my job to help them see the game. What can I tell them now? Steve Wiseman at The Herald-Sun quotes Fernando Perez on potential for callups and effect on the game. Adam Sobsey at Triangle Offense quotes Charlie Montoyo on the same topic. An afternoon game. Get on the bus. Come back home to stay for a week or so. And on a win. 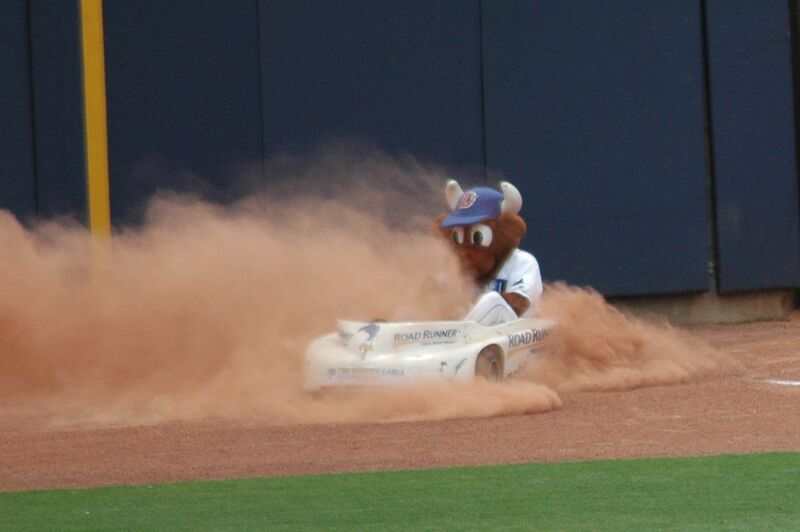 Not just a win, but the most wins ever in a Triple A Durham Bulls season (84) with eight games to go. The 25 year-old Ashley has some decent numbers and can obviously hit the ball (although Knights Stadium isn’t a good test). Looking forward to seeing him on the field today. On the other side of the coin, Mike Ekstrom may have gotten the win, but only after taking it away from Richard De Los Santos. His four-run 4th inning, even with the three K’s, sounded really ugly. Neil Solondz has a couple of interesting interviews up on the Bulls website. From Saturday he has a chat with Rocco Baldelli, who has nice things to say about Charlie Montoyo and the Bulls and notes a few differences between the 2008 and 2010 Rays. From Sunday there’s a chat with new guy Bobby Livingston, who talks about his at bat. Note: I think he was the first Bulls pitcher to go to bat this year, in fact the first pitcher in a very long time. Speaking of pitchers, here’s an updated chart. For all the new guys — McGee, Shouse, Ortiz, Livingston — we have small sample size problems, much like the beginning of the year. On the other hand, the turmoil in the pitching ranks is not going to get any better. In fact, it’s likely to get worse. 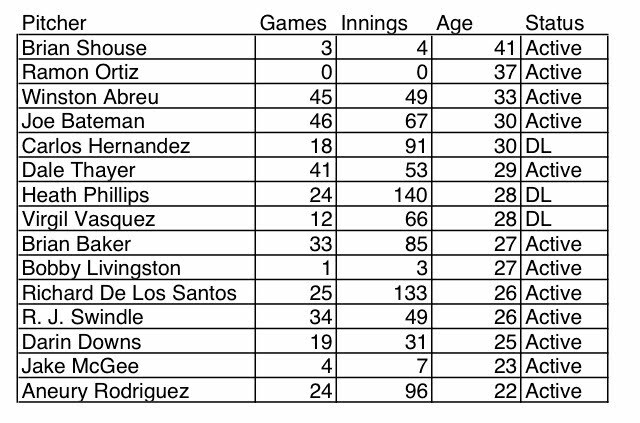 Three of these guys are on the Rays’ 40-man, which means they could easily get called up. And the Rays have some room to add a couple to their 40-man. Maddon said the first wave of September callups will include 4-5 players, with a third catcher (Dioner Navarro) likely. One intriguing name under consideration is LHP prospect Jake McGee, a former starter who has pitched 12⅔ scoreless relief innings since getting promoted to Triple-A Durham. That includes 20 strikeouts and just one walk. Here’s hoping that whatever happens we remain in decent shape for the playoffs. Just to wrap with a bit of trivia: The Rays and Yankees have been in a tied for first place for the last six games. Don’t want to get to upset over this trip. Counting today (Sunday) the Bulls have played 18 games in 17 days, all but two of them on the road. We’ve already done some ranting about this weird schedule, but it really is tough on the team. Fortunately, the Bulls come home for eight days at home and a day off before they go play either Louisville or Columbus. The game stories, sad as they are, are at the links. But a few oddities are worth pointing out. Angel Chavez got his first chance to shine as a pitcher in the first game against the Braves. Pitched a scoreless inning. In this entire year, the Bulls have lost on a walk-off only five times, but twice in the last two days. Because of some exceedingly weird lineup juggling yesterday Justin Ruggiano got in some time at third base! Just an inning, but he handled his one opportunity cleanly. As part of that same weirdness, new guy pitcher Bobby Livingston got an at bat, and drew a walk. All that weirdness was driven by Joe Dillon coming out of the game. Enough. What about other stuff? Jeremy Hellickson’s first try as a reliever did not go very well. Dan Johnson was a hero in yesterday’s game against the Red Sox. Blogger at DRaysBay likes Elliot as much as we do. Stacy Long is reporting and Houston Baptist University is announcing that Xavier Hernandez, the Bulls pitching coach extraordinaire is going home to Houston to be their assistant baseball coach. Huge loss to the Bulls and the Rays system, but sure looks like a good choice for X and his family. Sorry to see X go. Have to think that he’s has had a lot to do with the Bulls success the last couple of years. "It's been a great run with the Tampa Bay Organization and here with the Durham Bulls," Hernandez said after Wednesday's loss to the Norfolk Tides, "While I'm somewhat saddened to be leaving, I'm very excited as are my wife and four children since I'm going back home and still doing what I love to do, coaching baseball. I'll get to spend a lot more time with my family." Well, all good things have to come to and end and the Bulls run against the Tides of six in a row came to an end last night. Two of the new guys, Ramon Ortiz and Brian Shouse, made their first 2010 appearance with the Bulls at the DBAP. Mike Ekstrom was back from the Rays. The weather was not brutally hot. But you have to think that the Bulls are really, really tired of playing this Norfolk team — seven games in a row! And three more next week! What could be worse? Well, maybe next year when the Bulls start the season with six away games (against Gwinnett and Charlotte) and finish the season with six away games (against Charlotte and Norfolk). Have to wonder if the Bulls front office gets any input into the schedule. Surely they don’t agree with something as stupid as the last couple of weeks. Meanwhile, back at the game, new guy Ramon Ortiz had a nifty six pitch first inning, but things got ugly in the second — single, single, single, grand slam. “Other than that, Mrs. Lincoln, how was the play?” Not bad. One run on a walk and a double in the next inning. Pretty clean through the 6th. Mike Ekstrom came on in the 7th who was, in the immortal words of Bulls broadcaster Neil Solondz, “Perhaps a little bit inconsistent.” Walk, single, single (run scored), K, single, K, K. So he escaped a base-loaded situation and was actually looking a lot better at the end of it all. Dioner Navarro’s two perfect throws to catch runners in the 6th inning (well, maybe Chavez’ tag of Davis was a bit late) brought him to my attention as I begin to speculate about what the Bulls will look like next week. Surely Navarro is a prime candidate to return to the Rays come September 1. For a lot of reasons. He’s doing quite well these days: wOBA .371. At 34%, his pegs to catch baserunners is running slightly above his major league average of 30%. Yesterday Rays catcher John Jaso put in some time at first base (as well as catching) which, unless it was another instance of Maddon being quirky for the sake of being quirky, implies that the Rays wouldn’t mind having another catcher around. How important is Navarro to the Bulls? That depends on how badly Jose Lobaton hurt himself in Norfolk a couple of days ago. I didn’t watch all that closely while he was warming up pitchers last night, but he was out there. So have to guess that he’s OK.
Craig Albernaz, one of my all-time favorite Bulls who only has one game with us this year, is down in Montgomery and, I assume, available for a call up. So we would probably be OK, although hard to tell how much our pitchers might miss the more experienced Navarro. Which brings to mind seeing Michel Hernandez chatting with guys in our dugout on his way to the coach’s box last night. Sure liked watching him play for us and the Rays last year. Wonder if he might be available for our playoff run? Lastly, I learned a new phrase last night, "sports turf manager". That means the guy who takes care of the field, in our case, Scott Strickland, who was recognized as being the best in the International League last night. Good work, Scott. Could be. Or maybe Charlie knew that the crowd would cheer him off the field if he was pulled while the inning was in progress and he wanted De Los Santos to be able to savor it. That’s what happened. We cheered. De Los Santos deserved it. Great job this year. It was mostly a pitcher’s night for both teams. Nice defense kept the Tides off the scoreboard, particularly a strong throw from Ruggiano in right to Luna at second to Navarro guarding the plate. While two minor mistakes by Norfolk’s Troy Patton (hitting Richard and Baldelli after a Ruggiano single loaded the bases) was enough to set up Durham’s only run on a sac fly by Dioner Navarro. Jake McGee had another impressive appearance. So far (10 2/3 innings) he has not had a run scored on him. It has been almost exactly a year since Winston Abreu came back to the Bulls after some time in the Cleveland system. A huge piece of what the team has accomplished in that year (and it has accomplished a lot) can be put down to knowing that they’ve got someone in the pen who can finish a game off. He did it again last night, setting down the Tides in order for his 21st save. Wall Street Journal looks at the other side of success. Profile of Bulls pitching coach Xavier Hernandez. The Bulls are home for a very short two-day visit after their 11-day/12 game trip and then off for a four day run back to Gwinnett and Charlotte. Have to think that they are really getting tired of I-85. But it’s for the last time. Then they are home to stay until the beginning of the playoffs, which will start in either Louisville or Columbus on September 8. A good time to look at these pretty, pretty charts. The Bulls are very close to setting several all-time AAA Bulls records (if they haven’t already set them). But let’s just look at these pictures for now. Instead of resting on their laurels, with a 8-game, on the road, winning streak, the Bulls are getting better. 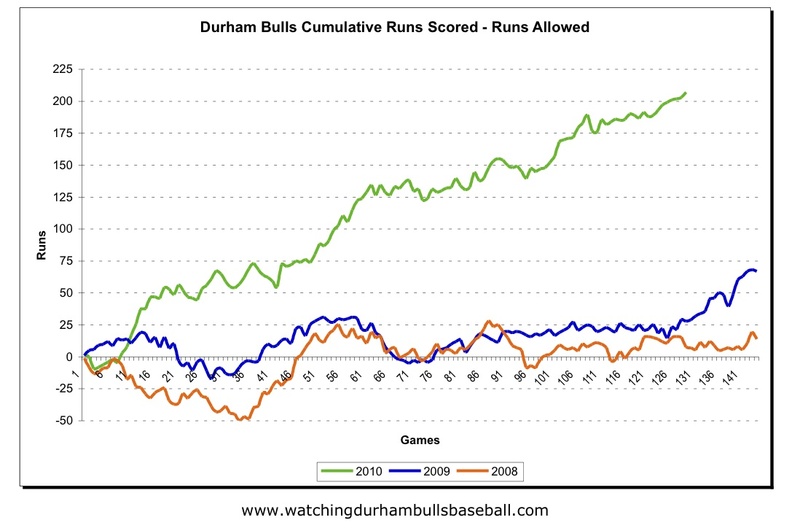 The runs scored minus runs allowed chart shows the last two years, when the Bulls also won the South Division. If possible, this is an even more dramatic view of the remarkable season the Bulls have had. Unlikely we’ll see something like this again, so we (and players) should enjoy it. 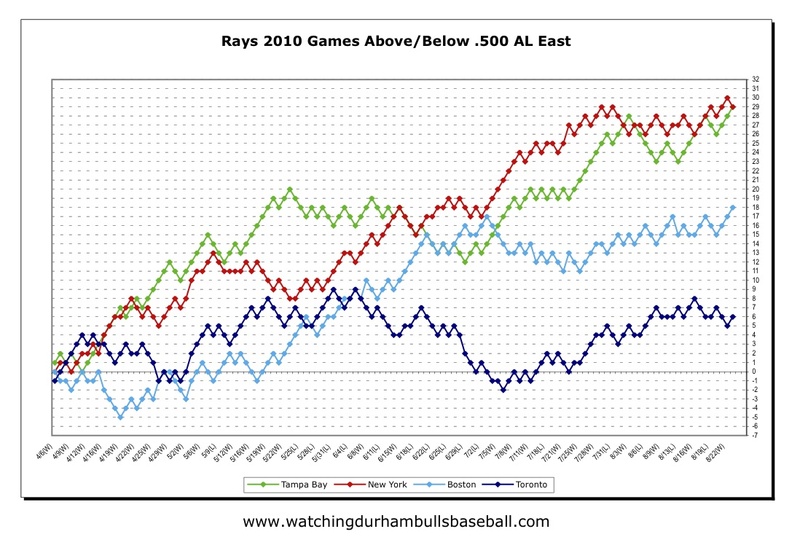 Meanwhile, down in St. Petersburg (actually, they are out on the left coast at the moment), the Rays are having a pretty decent year as well. They have only played 125 games to the Bulls 129, and they are only 29 games above .500 to the Bulls 35 games above .500, nevertheless, not too bad a year. Clearly positioned for a run at the championship again. Dale Thayer and Mike Ekstrom are on their way back to the Bulls. Thayer did not make it into a game while with the Rays this time. Ekstrom had three appearances for 3 innings: 1 hit, 1 walk, 5 Ks. Dan Johnson, who is not doing well with the Rays yet, still has a friend among the bloggers. 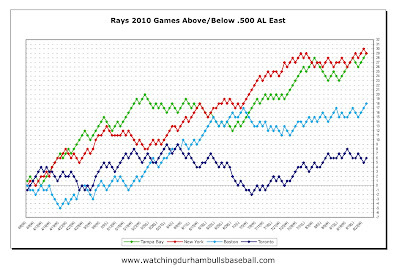 And speaking of bloggers, here are two different takes on the same data regarding Rays finances — Rays Index and DRaysBay. Why should we care? Because the financial health of the Rays has a direct impact on the Bulls' roster. Looks like they are spending a good bit on minor league operations, which is all good as far as we are concerned. How about Brian Baker? He goes head-to-head with Norfolk’s Chris Tillman and over seven innings Baker gave up only one hit while Tillman gave up two. Baker left the game with a shutout. Plus the Bulls got a run at the beginning of the next inning so he got the win. Baker has managed to put together quite a year for himself. He’s been in 34 games (9 starts), put together an ERA of 3.34, an FIP of 4.07, and is 8-4 on the year. He came to the Bulls as a long reliever, but has been thrown into the breach as a starter fairly often (we won’t look too closely at his last two starts). Not only that, he’s fun to watch. R. J. Swindle and Winston Abreu came in to keep the Tides in check. Desmond Jennings singled, stole second (33, tied for league high), and was driven in with a Justin Ruggiano double (his 29th, tied for 5th). That one run was enough for the Bulls 80th win this season. Checking my charts I was surprised to notice that almost a month has gone by since Jeremy Hellickson essentially left the ranks of the Durham Bulls after a start on July 24 (I won’t count his 3 inning appearance on July 29). Since that time the Bulls are 20-7. Says a lot about this team that we can lose our best pitcher and our best hitter and keep on keepin’ on. Great job by the team and the coaches. Over in the West Division of the International League things are really shifting around and Buffalo is lurking in the wild card race. Columbus just dropped out of first place and is a game behind Louisville. Worth keeping an eye on. 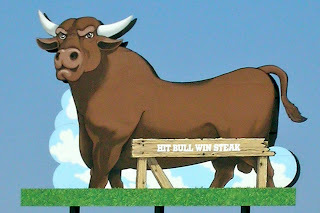 The Bulls clinched their fourth-in-a-row championship of the International League South Division last night when they beat Norfolk 3-1 and the Gwinnett Braves lost 3-4 to the Charlotte Knights. T-shirts were on sale within ten minutes after the game was over. That was a hint that the championship was not a surprise, and it wasn’t. Other than the hiccup just after the all-star break (which the Bulls followed up with an eleven-game winning streak), the Bulls have had and continue to have a great year. Video highlights at link on Bulls home page include a very nifty game-ending, championship-winning double play initiated by Justin Ruggiano. Last night was a good example of the kind of team we have this year. It was the Bulls fifth win in a row and they have made that run with only two starters being our “regular” starters. 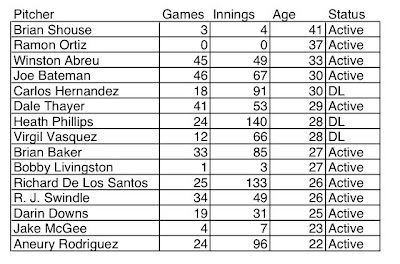 I put regular in quotes since neither of those two (Aneury Rodriguez and Richard De Los Santos) came to the Bulls with the intent of them being starting pitchers. The other three starters in this run were Darin Downs (recently up from Montgomery to work in relief), Bobby Livingston (new guy), and Ramon Ortiz (even newer guy). Still, what better guy to get the save than Joe Bateman? 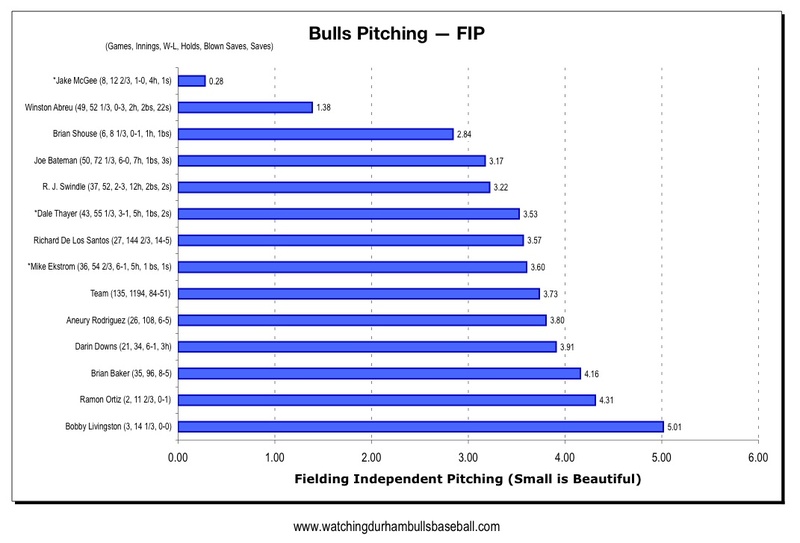 More appearances than any other Bulls pitcher this year. I was not listening when Ortiz was on the mound last night, so didn’t get any impressions of his performance. Comments from readers welcome. Did notice that Jake McGee got the win and kept his 0.00 ERA intact. Offensively two mature (old) guys showed the way. Chris Richard and Rocco Baldelli got Durham’s only hits, but they were enough. Pleased to see Baldelli’s first home run. Have to wonder how long he will stay with the Bulls. Would love to see him stick with the team long enough to play in Durham. Noted that Fernando Perez started the game, first start in quite a while (0 for 3). Joe Dillon is on the DL, apparently due to worries about hamstring, but not a re-injury. Now the trick is going to be keeping the focus for the next couple of weeks. Charlie Montoyo and his crew appear to be really good at that, so not really very concerned. Except that Dale Thayer is off to the Rays, so turmoil in bullpen is not going to let up. Interesting podcast/interview with Charlie Montoyo from Thursday evening. Speaks to roster changes, young pitchers, Elliot Johnson and Rocco Baldelli. Ramon Ortiz gets a profile over at The Process Report. At the same site there’s is a review of the Rule 5 draft. Don’t understand that? Join the club. Nevertheless, one current Bull and a couple that we’ve seen are apparently affected: Anuery Rodriguez, Heath Rollins, and Emeel Salem. Yesterday John Romano at the St. Petersburg Times made the argument for sending Jeremy Hellickson back to Durham for a couple of weeks. Well, after another very impressive start out in Oakland, the Rays did send him to the minors, just not to the Bulls. Stories here and here. 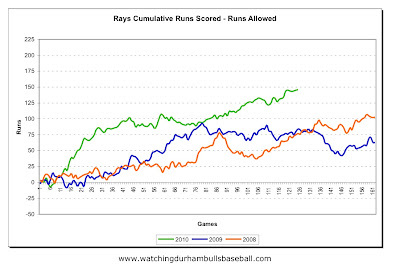 Surely more to come on the usual Rays blogs. For those interested in minor league life here’s a good, if overlong, article (cries out for an editor to whack about 2,000 words out of it). Over at Flip Flop Fly Ball he takes a look at the Red Sox. You’d think that since we drive to the Durham Bulls Athletic Park more than sixty times a year we’d find something better to do when the Bulls are out of town. But there we were bouncing along the torn up Roxboro and Mangum Streets (what’s the deal with that Durham?) last night while the Bulls were waiting for the rain to stop in Fort Mill, South Carolina. The occasion was a show at the Durham Performing Arts Center — a first-rate venue that if you haven’t tried is worth a visit. The same parking attendants work Bulls games and DPAC events. I tried waving my Bulls pass going into the parking deck, but the attendant just smiled and held her hand out for the $5.00. I mention this all because if you have figured out how to get to the DBAP then you can get to a show at the DPAC and it’s a very nice place to spend an evening. It was a little after 10:30 by the time we got out of the show (Lyle Lovett, terrific) and out of the garage to a point where we could get 620 on the radio. Bulls at bat at the top of the ninth, nobody out, but two K’s and a ground out later, nobody scores. It did not not sound good. But then I find out that the Bulls are ahead 5-1 going into the bottom half. So all is well. What jumps out from the box score is the terrific night had by Bulls’ pitchers — no walks, 12 K’s, only one earned run. Aneury Rodriguez, who’s had quite few days off since his last appearance, had a terrific night. New guy Paul Phillips gave up quite a few hits, but nobody scored in his second appearance. Elliot Johnson continued his hot streak; Chris Richard’s homer got him up to 60 RBI, but Justin Ruggiano kept his lead at 63 with an RBI single. The Bulls are 30 games above .500, the best they’ve been all year. They are moving ever closer to clinching the playoff spot in the South Division. Louisville, after a very unfortunate series (for them) against Columbus are sneaking back into contention in the West. Norfolk, the Bulls next opponent, is one game away from elimination. Thanks to careful reader Fritz who pointed out Adam Sobsey’s piece on Fernando Perez in this week’s Indy Week. Fans interested in Perez, or just the life of a baseball player, will find it an interesting read. The Bulls play in Norfolk tonight. Wonder if they even stopped for a cup of coffee as the bus rolled past Durham last night. 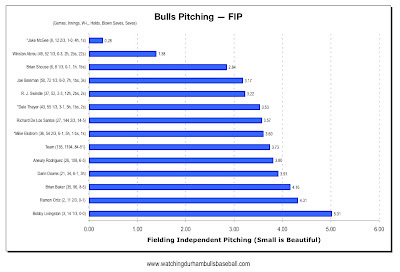 To say that the Bulls’ pitching situation has been difficult over the last two days is not exactly accurate. Chaotic might be a better word. In Friday’s game Heath Phillips pitched one inning, gave up four runs, left the game, and is now reported to be on the disabled list. Carlos Hernandez (who came off the disabled list a couple of days ago) came in, pitched two innings, and is now reported to be back on the disabled list. Aneury Rodriguez came in to hold things in check for five innings, but the offense could not quite catch up. Plus, since Rodriguez was supposed to start Saturday, Montoyo and X. Hernandez had to do some scheming. As an aside, I like watching Carlos Hernandez pitch. For those new to the Bulls, he’s been around for much of the last two years. He started 21 games last year and he’s got 18 appearances this year. And yet I also worry about him. If he’s back to the DL you’ve got to wonder if he will be around to finish the year with us. I hope so. Outside of the pitching problems, Friday’s game also saw new outfielder over from Montgomery, Emeel Salem, take left field and hit a double in his second at bat. Because Aneury Rodriguez pitched Friday, Charlie Montoyo had to get creative for the double-header yesterday. He started the first game with new guy Brian Shouse. I couldn’t chase down the last time he started a game. However, in 10 years in the majors (467 games) he doesn’t have a one. Unfortunately, the baseball gods don’t necessarily smile on either ingenuity or necessity. Shouse gave up four runs in the first inning and that was enough for Gwinnett to take the game. Need to mention Darin Downs. He pitched 4 innings of 1-hit baseball. Very nice performance. He’s looking better every day. Nice to see Elliot Johnson back in the lineup. Back to Shouse — Chris Richard is no longer the “old guy” in the clubhouse. Shouse (41) has him by several years. Which brings us to the second game of the double-header and a very nice 2-inning start by Jake McGee. Four K’s, still no walks for the left-hander. Followed by 2 innings by Dale Thayer, 2 by R.J. Swindle (who got the win), and one by Winston Abreu. Brian Baker will be starting today and, if he can hang on, the pitching situation might settle down just a little bit. Nice to see the 13-hit performance by the offense. 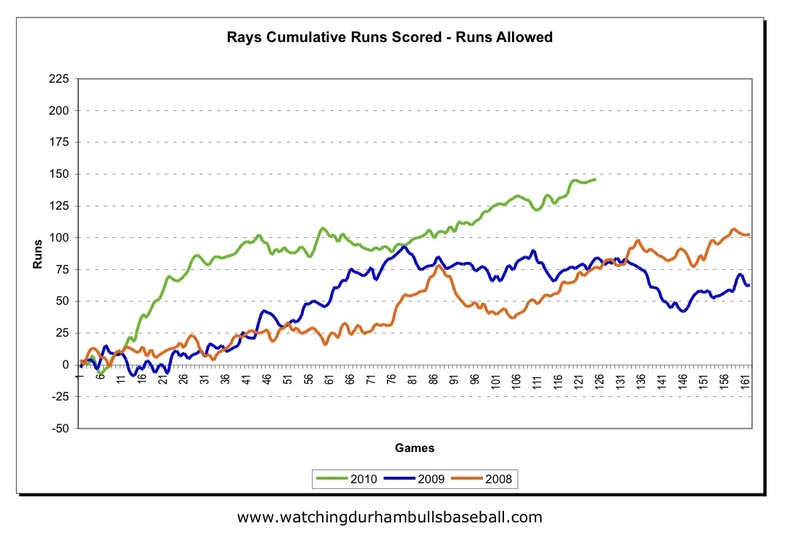 Of course, as soon as the Bulls leave town the Rays will cascade down a bunch of roster changes. It's a plot on their part to keep Bulls fans in the dark. On the other hand, maybe they read my post yesterday and decided to do something about it. First of all, thanks to DRR for the heads up. As mentioned earlier, Carlos Hernandez came off the DL yesterday and may start tomorrow. Probably on a low pitch count/inning limitation. Brian Shouse, on a Rays minor league contract, disappeared from the DL part of the Bulls roster today, but is reported to have been pitching in Charlotte, Florida and on his way to the Bulls. Left-handed, side-arming reliever. Probably a “lurker” for a September plus up for the Rays. They seem to like sidearming specialists (except for Joe Bateman whom they have been ignoring, so far). Rocco Baldelli, in the same report, is heading for the Bulls as well. No idea whose roster he will end up on. Stacy Long is reporting that outfielder Emeel Salem is on his way from Montgomery. If I were a betting man, I’d be betting that Fernando Perez is heading for the DL. Welcome to August/September in Triple A. I glanced at the changes for Gwinnett and they’ve got many more than the Bulls. Time to give Richard De Los Santos his due. We can do that by comparing his numbers against the Bulls’ ace, Jeremy Hellickson. That may seem odd, but just look at the them. Not bad at all. De Los Santos obviously lets in more runs and, if watched closely, does not seem to have as much of that elusive “stuff” that Hellickson brings to the game. And yet he’s winning games. Now, if he could just tuck his jersey in. Several times last night the ump asked him to tuck it in. Here’s where a careful reader can help me. The Bulls used to have an infielder who had a similar problem keeping his shirt in, but his name eludes me? Any help out there? How important is De Los Santos? Very. His solid seven innings last night will make a huge difference over the next couple of days. The Bulls are still short, even with the return of Carlos Hernandez from the disabled list. We saw Hernandez warming up in the 6th inning and thought we might see him. But De Los Santos got out of the 6th and even through the 7th, giving some room for Joe Bateman’s two-inning save. The hitters were in fine form last night. In fact, they have been in good form most of this home stand. In seven games, 75 hits, and that includes a game with only 3 hits and another with “only” 8. All this when the Bulls have been short pitchers and position players. By now, the Bulls are in Georgia for the first time since their short, rainy visit in mid-June. This begins a round of 12 games in 11 days throughout the South — four games in Georgia, three games in South Carolina against Charlotte, five games in Virginia. This will be a time to remember that baseball’s a game and can be fun to play. I’m guessing that’s about the only way to get through this round. 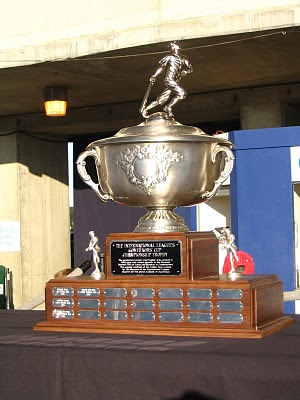 Up in the northwest the news is that Louisville has had an extraordinary run and has pushed Columbus out of the lead in the West Division of the International League. Here in the South Division, the Bulls “magic number” is 11 [was 12, wrong, fixed]. Essentially, if the Bulls play .500 ball, they cannot be beaten. Last night I turned a new page in my scorebook. I’ve been using the Reisner System and finding it very useful for the casual fan’s purposes. Worth a look if you’re one of those who takes a pencil to the ballpark. Let’s start off by acknowledging the extraordinary physical fitness of the players on the field last night. The heat index at the beginning of last night’s game was 108° and it was only slightly better at the end of the game (although a small storm was blowing in). In particular, a sip of well-iced tea to the catchers — the Bulls’ Dioner Navarro and the Knights’ Tyler Flowers — seriously tough guys to get through 188 (Navarro) and 248 (Flowers) pitches over 4 hours in catcher’s gear in that kind of heat. More than that, Navarro managed to get two singles and a double while Flowers got a single and a double. The game ended in a bit of low comedy — two walks and a sac bunt gone awry loaded the bases. A grounder dribbled through the legs of the Charlotte shortstop and Joe Dillon came home. By that time I was at home watching on TV, drinking some ice water. Fist pump, take a shower, go to bed. The younger Bulls, of course, probably went out carousing for all hours and will be bright and chirpy tonight. Ahh, youth! To rewind a bit, however. 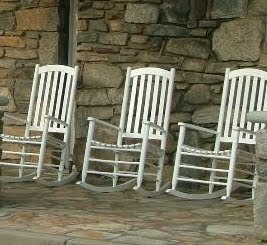 Can’t let Desmond Jenning’s bit of lollygagging in the first inning go by. A shallow fly ball with a runner on third was followed by a poorly thrown, rainbowed toss that let a run in. J. J. Furmaniak started in right field. J. J. has a wealth of experience at that position. In fact it was only a couple of years ago, in 2007, as a Sacramento River Cat in the PCL, that he had one game in right field. And he had maybe 30 minutes warning. So there really wasn’t any excuse for his deer in the headlights approach to his first two fly balls in the 2nd inning. He did, however, make his first out as a right fielder in the 5th. Virgil Vasquez really got hammered. Hope it was just the heat. Think that Jake McGee was on a different set of instructions last night. Instead of the fireballing we saw his first outing, this time it was a bunch of sliders/curve balls in the middle 70’s mixed with fastballs in the low 90’s. He did OK, but the stats don’t show that he came in with bases loaded and let all three runs in. 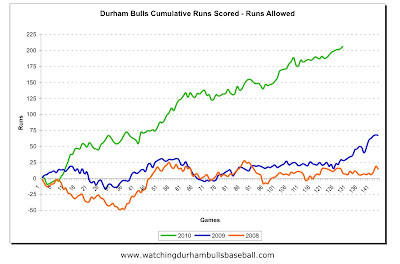 We mentioned yesterday that the Bulls hadn’t been hitting home runs lately. That changed last night, big time. Ruggiano, Richard, Dillon, and Chavez all homered. Nice to see. In general, when Winston Abreu comes into the game, and a runner gets on, they don’t bother holding the runner on first. It hasn’t mattered all year. It did last night. In the 9th Winston gave up a leadoff single. The next batter popped up. But during the next at bat they let the runner just trot on to second base. Defensive indifference. A single brought him home. A wild pitch put that runner on second. a double brought him home and the game was tied. Abreu had his first blown save of the year. Too bad. Adam Sobsey gets poetic over at Indy Week. We blew up our bullpen last night. Here’s hoping Richard De Los Santos can go a bunch of innings tonight. More on that later. The Rays put two of their starters on the disabled list (former Bulls Jeff Neimann and Wade Davis) and called up Mike Ekstrom to keep Jeremy Hellickson company as the Rays try to sort out some of their pitcher/pitching concerns. Why, you may ask, didn’t they just keep Dale Thayer with them? Or why didn’t they call up Ekstrom in the first place? And are they going to reach down and grab another one of our starters? Or maybe bounce Jake McGee all the way up? Or maybe call Dale back? We’ll let Joe Henderson of the Tampa Tribune and any number of others meditate and agonize over all of that. 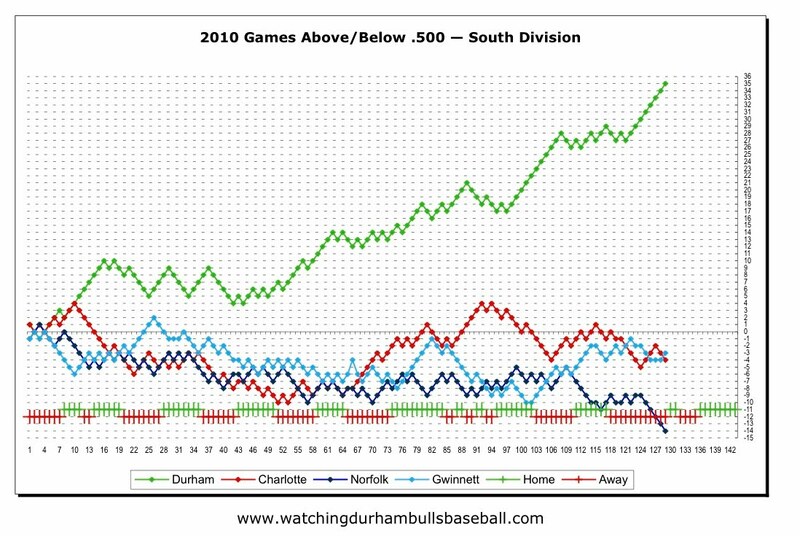 As stated many times, this is a blog about the Durham Bulls, and where are we these days? (7) is rolling over fair territory and a fielder, without actually touching the ball, intentionally commits an act (such as blowing on the ball, moving or digging dirt, etc.) that causes the ball to roll foul. Further, if a batted ball is moving over foul territory, has a chance to become fair, and a fielder causes the ball to be touched with detached gear, it is a fair ball. This is going to be a moving target for the rest of the year. But just to get ready for tonight, here’s what we’ve got. So who gets the start against Charlotte tonight? Here’s where Montoyo and Hernandez earn their pay. We can only guess that it will not be Phillips or Rodriguez or Vasquez. Maybe De Los Santos? In the meantime, thanks to NCSue, here’s a cool video to start the day. This was one of those games that was just fun to watch. Pretty afternoon, if a bit warmish. Mostly very good baseball. Indianapolis made a couple of errors, but they also had a couple of nice double plays (they had 10 in the series!). If the fans were disappointed in not seeing Hellickson pitch, I didn’t hear anything. Plus we saw some really good pitching on both sides anyhow. Aneury Rodriguez got the start and held the Indians to just one hit through four innings, but he did give up a bunch of walks, to include putting two guys on base with one out in the 4th. Then, and here is one of the reasons that won-loss records don’t count for much, Joe Bateman came in for a very nice strikeout and ground out on thirteen pitches and got the win. We then got our first look at Jake McGee. A very impressive first look it was. He struck out the side in his first inning of Triple-A baseball and had two K’s and a flyout for his second. He didn’t throw a pitch below 92 mph and most were much faster. Here’s the numbers on his last batter: 95/95/97/96. Overall 22 pitches, 18 for strikes. Then in a very evil move, Montoyo switched to R. J. Swindle who has a fastball that, on a good day, with a following wind, breaks 80. And a curve ball that loops in there at 50 mph, or so. He went 1 ⅔. Winston Abreu came in for the last batter (a righty) and his 17th save. It seems that every time I’m about to write something negative about Justin Ruggiano’s year and especially his strikeouts (he broke 100 the other day), he comes up with a terrific night. Then I have to take a look at the rest of the numbers. He had all the RBI last night and he was 4 for 4. His average is up to .285 and he is now the team leader in RBI with 57. Plus he made a nifty play in the field. Fernando Perez got in his ½ inning in the field last night. No word on when he will be back in the game. The Rays had a tough day yesterday. Over at Her Rays, Jessica has a few admonitions for her Rays. The Wall Street Journal comments on that game, and more. It’s a really old joke, but what the heck, I’m a really old guy. Trust me. It’ll connect eventually. At morning formation the company commander calls the First Platoon leader over. The platoon snaps to a rigid attention, eyes to the front, heads still. So it might have been yesterday afternoon. Xavier Hernandez goes into the locker room to go over the Indianapolis lineup with his starter. When Hellickson stands up, he’s told to sit down. Or maybe asked where Rodriguez was. And then he was told to pack his glove he was headed for Detroit. The Durham Herald-Sun is reporting that Hellickson is to pitch in tomorrow’s Rays’ game in Detroit. Here's a link to ESPN. They are reporting that Jeremy Hellickson is out of today's lineup. And Mark Topkin is reporting the same story as is Tony Fabrizio. Maybe Jake McGee will end up being a starter after all. When your opponent outhits you and you still win the game, then something else was probably going on. In this case it was a series of timely mistakes and, hindsight now tells us, errors of judgment by Indianapolis’ manager and good ideas by Durham’s manager. In fact, you could say that our manager outmanaged their manager. Starting pitchers did their job. Durham’s Heath Phillips was pretty good, Indianapolis’ Charlie Morton was even better. But the managers? Well, here’s the way I saw it. In the 8th the Bulls were down 3-1. Indianapolis sent in reliever Daniel Moskos, who had pitched an inning the day prior. Elliot Johnson got a single, Justin Ruggiano drew a walk. Montoyo told Johnson and Ruggiano to run with Chris Richard on an 0-2 pitch. Richard grounded out, but a double play was prevented (one out, runners on second and third). Moskos struggled with Joe Dillon and then Indians Manager Frank Kremblas called for the intentional walk. Maybe the idea was to get to newcomer Leslie Anderson and set up a double play (which the Indians have been very good at this series). Didn’t work. Moskos hit Anderson and a run was in and bases were still loaded. So Kremblas changed pitchers and brought in Brian Bass, who had also pitched the previous day. Bass walked Angel Chavez, bringing in the tying run. Jose Lobaton dribbles a ball in front of the plate that Bass can’t handle correctly and the go ahead run scores, bases still loaded. Lastly, for the first time in the inning, the ball leaves the infield when J. J. Furmaniak hits a single scoring two runs. Player of the game: J. J. Furmaniak. Manager of the game: Charlie Montoyo. Have to say something about yesterday’s game in Toronto. You’ve got to think that the Rays really aren’t looking forward to listening to “O Canada” again any time soon. Dale Thayer was called in to try to put out a bonfire. In the first four innings Toronto had “touched” James Shields for 9 hits, 4 walks, 6 homers and eight runs. Dale poured gas on the fire: seven hits, another homer, six runs. Ultimately the game ended with Toronto ahead 17-11. Dale is on his way back. On the other hand, Dan Johnson got 4 RBI on a home run and a sacrifice fly. He’s doing just fine since he’s been up there (17 plate appearances, .273/.471/.545, wOBA .441). In response to a reader’s question I did a simple run-through of the rest-of-the season schedule of the Bulls to see when Jeremy Hellickson will next pitch in Durham. The answer was that he will not be pitching here again in August and by September he will probably be with the Rays. If we assume that the Bulls stick with a five-day rotation, then Hellickson would be scheduled to pitch today (Indianapolis), the 14th at Gwinnett, the 18th at Charlotte (there’s a makeup game that needs to be slipped in while at Gwinnett), the 23rd at Norfolk, and the 28th at Charlotte. The next game he’d be up for is on September 2 in Durham against Gwinnett. However, you have to think he’ll be with Tampa Bay by that time. Or even sooner if Jeff Niemann’s shoulder problems are worse than reported. Today (Sunday, August 8) may be the last appearance of Jeremy Hellickson in Durham, ever. Note for careful readers — if I’m wrong, and I hope I am — let me know soonest and I’ll get a correction up. Thursday’s game is now scheduled for Friday at 6:00 pm. Come early, stay late, since it’s gonna be a double header (my guess is 7-inning games). In the meantime here’s some info on our two new Bulls just arriving from Montgomery. Leslie Anderson sounds like he ought to be 6’2”, blond, blue-eyed, with a chiseled chin and a family back in Wisconsin. But he isn’t. He’s 6’1”, speaks limited English, and has been somewhat secretive about just where his family is or how he happens to be in the U.S. at all. A former member of the Cuban National Team, he apparently fell out of grace with Cuban authorities a while back. He was signed by the Rays this spring drawing some attention from the St. Pete Times, Rays Prospects, and DRaysBay. On the 40-man, the thought all along has been that if he can adapt, he looks good to be in Tampa in September. I think he has been mostly playing the outfield in Montgomery. Decent stats. Jake McGee is also on the 40-man and trying to re-create a career interrupted by Tommy John surgery a while back. According to the Montoyo interview aired while the rain was coming down, McGee is to be in the bullpen here even though he was a starter all year in Montgomery. Here’s a profile from back in February and a more recent one. A youngster for this year’s batch of Bulls, He turns 24 on Friday. Career stats here.